One of the greatest gifts of friendship is that they’re there for you when you need them. When you’re having a tough time, need support or are feeling down it’s friends who pick you up and help you out. They don’t judge they just want what’s best for you. Friends like these are beyond special, and should always be treasured. We’re lucky to have people like that in our lives. Which is why you may want to send them a note or message of thanks. 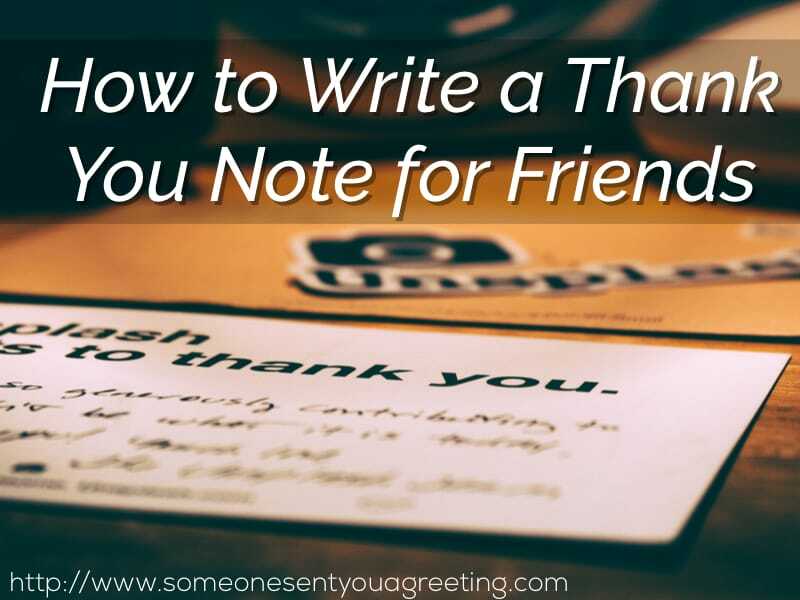 Thank you note for friends are not only polite to send when someone has really gone out of their way to help but they’re also a great way of just generally showing your appreciation to someone. Maybe a friend has supported you through a really hard time – divorce, bereavement, loss of job etc. Maybe they’ve given you a really great gift. Or maybe you just want to thank them for years of amazing friendship. Send a thank you note and let them know how much they mean to you and you appreciate them. Use some of the example notes and messages below to either write your own or copy them as they are. I just wanted to let you know how much I value our friendship. Through thick and thin you’ve always been there for me. If you look up the definition of “friend” in the dictionary there should be a photo of you! The last few months have been so tough for me but through it all you’ve been there. I don’t know what I’d have done without your unwavering support and friendship. It means the world to me and I can’t express how much I appreciate it. You’re always by my side, never judging me and forever supportive. Basically all the things a great friend is meant to be. And I appreciate that more than words can say. I don’t deserve a friend like you but am so grateful I have one. Thank you so much for the lovely gift. You went to so much trouble to find me something you knew I’d love. It’s a lovely, generous gesture and I’m ever so grateful for it. Thank you again! I don’t say it enough but you’re a true friend! We’ve had such amazing times together that I can’t imagine my life without you. So I just wanted to to send this note to tell you how thankful I am to have you as a friend. I can’t wait for even more years of fun with you! Whilst buying a thank you note or card is simple and offers a well written thank you message or gesture it is a little impersonal. If you can try to buy one that allows you to add your own message. alternatively write a note on blank stationary and include that in a card. You can even send the note on its own in a pretty envelope if you want. The messages below are a quick and short message to include in a card. You’ve always been there for me. Thank you. These words won’t do it justice but I wanted to tell you how much you mean to me. Thank you for being my friend. This may sound silly but I wanted to let you know you’re an awesome friend! No particular reason, just I appreciate having you as a friend. If you receive a gift you should really send a note or message thanking the sender for their thoughtfulness. Use the examples below to help write your own. Thank You the lovely gift. I truly appreciate the kind gesture. My gift was so thoughtful! Thank you for thinking of me. Having you as a friend is more than enough! But thank you for the gift! You’ve given me the gift of friendship and a lovely gift to go with it. Thank you for everything! I can be tricky to buy gifts for but you nailed it! Thanks! 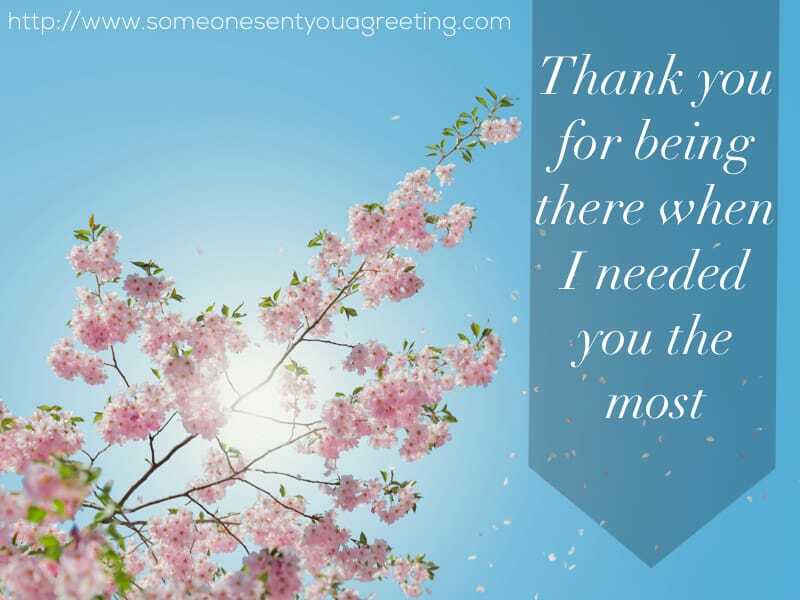 If you want to thank someone but don’t have the time to get a card and send it, or if you want to thank a large amount of people in one go then using something like Facebook or other social media is a great way to reach out. You can share a short and simple message to thank your friends through these website or apps if you’re in a rush or pushed for time. Just a quick update to thank everyone for the support! [@name] is incredible and has been there for me through it all! To all my friends – a huge thank you! Thanks for helping me out guys! You rock! So pleased you could be there for me. Thanks! Thank you all for being there. It means the world to me.